I made this recently while on holiday in France, but my lovely camera is sickly and was unable to cope with the comparatively low evening light levels despite an f1.8 lens so I didn't blog it at the time. Thanks to my lovely Abel & Cole veg box, I had broad beans and the most flavoursome red pepper I've eaten in a while at my disposal, so I decided to make it again. Thankfully, it photographed a little better this time - fiendishly bright halogen bulbs do have their uses. 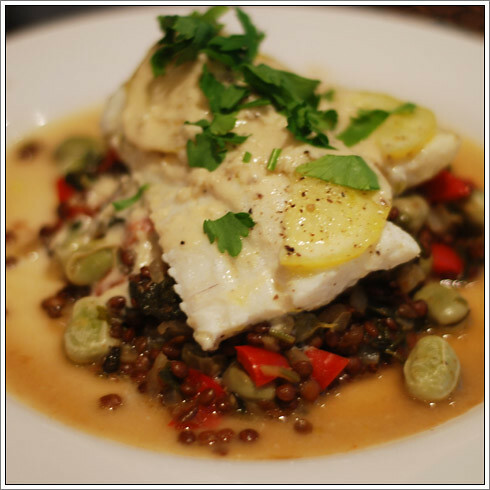 This has a slightly Moorish feel to it - tahini goes really well with white fish, and I felt like some earthy flavours to go alongside the delicious flakiness of the cod, hence the broad beans and lentils. When cooking with cod, I always make sure I buy sustainably sourced, though really, this should apply to pretty much all fish these days. If you're feeling lazy, like I was, use a tin of Merchant Gourmet puy lentils. It makes the cooking process that bit easier. Preheat the oven to 200°C, then peel and finely chop the onion, deseed and cut the red pepper into diamonds and pod the broad beans if stilll in pods. Fry the onion and the red pepper in a little olive oil with the cumin and coriander powder, add the drained puy lentils and broad beans and turn down the heat as low as it will go. Cover for 10 minutes then stir in the spinach, add half the lemon juice and cover again. To prepare the cod, cut each fillet in half widthways, then place two fillet halves on a square sheet of tin foil. Thinly slice three slices of lemon and arrange over the cod. Drizzle with a little olive oil, season with salt and pepper, then wrap the cod fillets into little foil parcels. Place in the oven for 10-15 minutes. While the cod is cooking, roughly chop the parsley and stir 3/4 of it into the lentils. At this point, you want to make up the tahini sauce. In a mixing bowl, put two tablespoons of tahini paste, a dessertspoon of olive oil and a tablespoon of lemon juice. Crush in the garlic and stir until emulsified. Finally, add 50-100ml of boiling water to thin to the same consistency as gloss paint and mix thoroughly. When the cod is cooked, remove from the oven and open the parcels. Divide the lentils between two plates, then place two pieces of cod on top. Pour over the juices from the foil parcels, then spoon over the tahini sauce. Finally, garnish with the remaining chopped parsley.